The three main vehicles for propagating sinningias are seeds, stem cuttings, and leaf cuttings. Two other methods used by a few are tuber cuttings and tissue culture. Most people who sow seeds have developed a favorite method. They have favorite containers, mixes, times, and treatments. I'm no different. I might, however, be more casual about it than most. I just sow in my usual growing mix, which has no perlite or vermiculite. I fill a transparent plastic clamshell salad container with the mix, moisten it with my normal watering solution (1/4 strength fertilizer), make partitions with plastic plant labels, and sprinkle on the seed. Before that, however, I draw up a chart showing what I'm sowing where. I usually mark on a plant tag stub what's in what section. Another method I've used is to make a diagram of the layout on a blank address label, and paste it to the bottom of the tray. Finally, I record sowing dates and locations in my computer log, so for each sowing project I have the data recorded in a minimum of two places. Jon Dixon bakes his seed-sowing mix for a couple hours in the oven. Before sowing, obviously. He says that suppresses fungi and moss growing in his seed mix after sowing. He uses a peat/perlite mix (with vermiculite too, I think), and says if he doesn't treat the soil in this way, he has problems with stuff growing on the surface. I moisten the soil and then microwave it for a few minutes before sowing, but even without this treatment I don't have problems with visible things growing on the surface. However, there are fungi not visible to the naked eye, and these might be suppressed by the microwave treatment, thus improving germination success. I try not to sow similar species next to one another. This is so that if a seed manages to wind up on the other side of a boundary, I'll be able to tell. One convenient strategem is to sow eastern-hemisphere gesneriads between the western-hemisphere gesneriads. The asymmetrical cotyledon growth of eastern-hemisphere gesneriads makes them easy to distinguish from sinningias. Another device I sometimes use is to sow seeds from different sources in the same tray. This gives me a better chance of knowing whether a problem is with the seed or with my sowing technique: if nothing comes up at all, it's probably my soil and/or treatment. Early transplanting of seedlings makes them grow faster. When a sinningia seedling has two-three leaf pairs, it is ready to move out of the community tray. Like others (such as Dale Martens) who advocate quick transplanting, I have found that this stimulates growth, so I get good-sized plants faster. I also move the seedlings left in the tray around, to spread them out more evenly, and I believe that this makes the "left-behinds" grow faster too. There are various products sold in nurseries and garden stores, claiming to help your plants overcome "transplant shock". I think transplant shock is quite rare. Instead, most plants experience "transplant euphoria" -- a spurt of growth due to more root room, more foliage room, or more oxygenation of the soil, or all of the above. Stem cuttings are not as straightforward as with other stemmed gesneriads, like columneas, nematanthus, drymonias, and aeschynanthus. The stems on a mature, determinate-growth sinningia will normally be flowering shoots. In my experience, such determinate-growth shoots root poorly. Even if they root, they usually will not produce new plants. Therefore, the best time to take stem cuttings from a determinate-growth sinningia, such as S. leucotricha or S. douglasii, is before maturity. Take advantage of the juvenile phase, when the growth is non-determinate, to remove tip cuttings for rooting. If the plant is almost mature, clipping off the non-blooming stems may encourage it to bloom sooner. Another problem with determinate shoots is the lack of nodes. Shoots root most easily and soonest if there are nodes "underground" within the potting medium. Roots formed from roots begin near the center of the root and break out through the root surface, but roots formed from stems mostly arise at nodes and (at least) do not give the appearance of being initiated inside the stem. Only if there is no node to root from do (sometimes) roots form at the cut end of the stem. In such cases, the cutting may form a tuber at the cut end, where the roots arise, and this tuber may or may not generate a new plant. The older the plant, it seems, the less likely it is that a nodeless stem cutting will create a new plant. Tip cuttings of sinningias with non-determinate growth, such as S. eumorpha and S. guttata, are usually much more successful. Since vegetative growth continues even on blooming shoots, the plant's hormones have not shut down the vegetative meristems. Peter Shalit recommends taking a whole stem, with a bit of the tuber. I have not tried this, but it sounds like a good idea. Some sinningia cuttings form new tubers quickly, while others take quite a while to do so. This may be related to how soon after germination a species seedling develops a tuber. This cutting of Sinningia aghensis has a noticeable tuber two months after being planted. 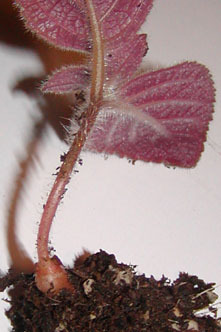 S. aghensis is a species whose seedlings form a tuber soon after germination (see a picture). I myself have never propagated sinningias by leaf cuttings, but I have heard that S. speciosa can be propagated this way. I have used satellite tubers of S. curtiflora and S. sp. "Black Hill" to make new plants. I have also cut off pieces of tuber of S. conspicua and S. hatschbachii to make new plants. In both cases, the piece I removed was an almost-separate tuber lobe. Finally, I have cut a few tubers in half, right down the middle, trying to make sure that each half had a growing point. I left the tuber halves to dry for a few days, so that the cut surface would callus. In all cases, both halves of the tuber died without ever sprouting. There must be a way to do this successfully, but I haven't figured it out yet, and (for obvious reasons) I am unwilling to risk one of my more valuable tubers this way. The late Marty Mines used to propagate miniature sinningias via tissue culture, and was very successful at it, but this method does require a commitment in space and energy beyond the means of most growers. Jon Lindstrom, professor of horticulture at the University of Arkansas, propagates his hybrids by tissue culture.